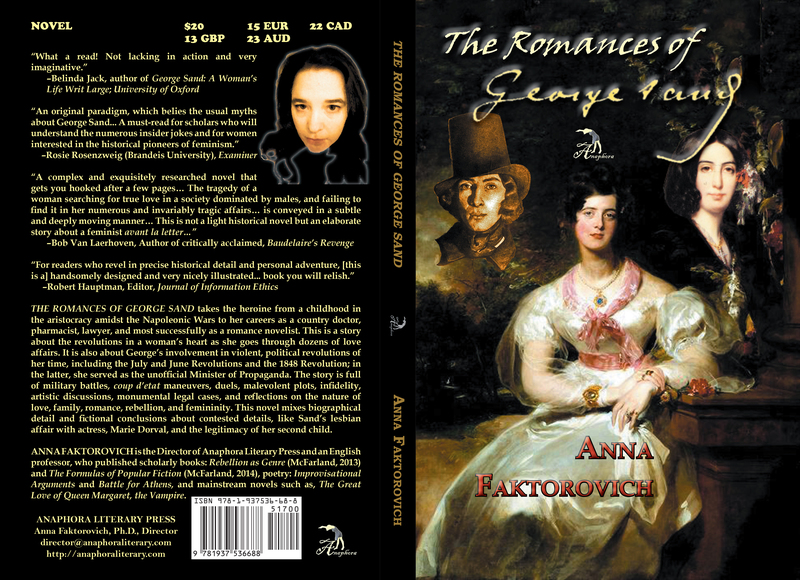 The Romances of George Sand takes the heroine from a childhood in the aristocracy amidst the Napoleonic Wars, to an unhappy early marriage and eventual divorce, to her careers as a country doctor, pharmacist, lawyer, and most successfully as a romance novelist. This is a story about the revolutions in a woman’s heart as she goes through dozens of love affairs. It is also about George’s involvement in violent, political revolutions of her time, including the July and June Revolutions and the 1848 Revolution; in the latter, she served as the unofficial Minister of Propaganda. The story is full of military battles, coup d’etat maneuvers, duels, malevolent plots, infidelity, artistic discussions, monumental legal cases, and reflections on the nature of love, family, romance, rebellion, and femininity. The history behind each of the events depicted is researched with biographical precision, but liberty is taken with some events that have been contested by historians, including the lesbian affair George had with Marie Dorval and the identity of the real father of her second child. 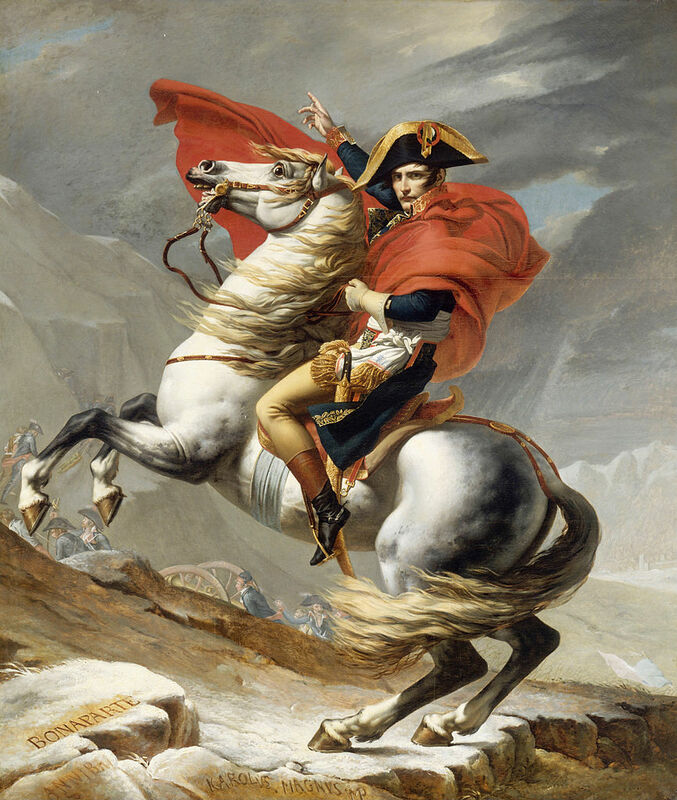 Students of literature and history will recognize many of the central characters, as George befriended Napoleon I and III, Alexander Dumas pere and fils, Frederic Chopin, Alfred de Musset, and a long list of other notables. 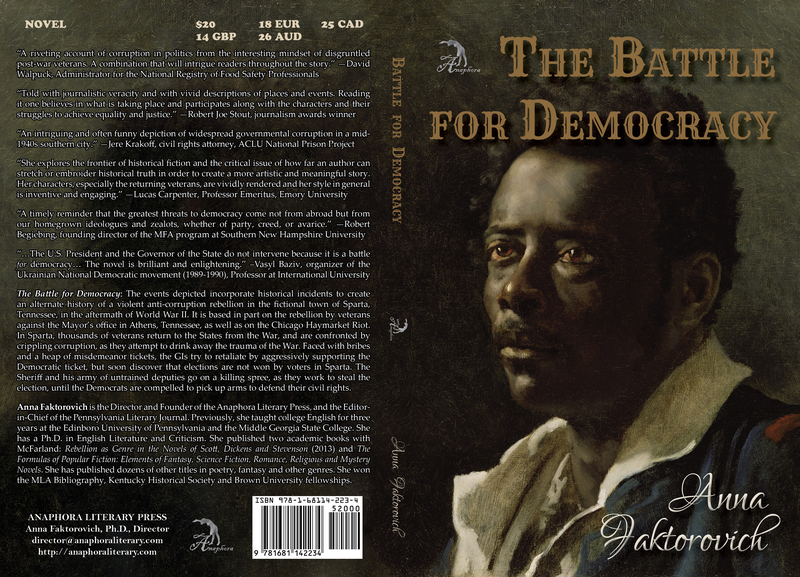 The Battle for Democracy: ($20, 236pp, 6X9″, 16 illustrations, reader’s guide, Print ISBN: 978-1-68114-223-4, Hardcover: $35: ISBN: 978-1-68114-281-4, EBook: $2.99: ISBN: 978-1-68114-224-1, LCCN: 2015917681, May 2, 2016; Order on Amazon or Barnes & Noble): The events depicted incorporate historical incidents to create an alternate history of a violent anti-corruption rebellion in the fictional town of Sparta, Tennessee, in the aftermath of World War II. It is based in part on the rebellion by veterans against the Mayor’s office in Athens, Tennessee, as well as on the Chicago Haymarket Riot. In Sparta, thousands of veterans return to the States from the War, and are confronted by crippling corruption, as they attempt to drink away the trauma of the War. Faced with bribes and a heap of misdemeanor tickets, the GIs try to retaliate by aggressively supporting the Democratic ticket, but soon discover that elections are not won by voters in Sparta. The Sheriff and his army of untrained deputies go on a killing spree, as they work to steal the election, until the Democrats are compelled to pick up arms to defend their lives and their civil rights. “Naive, impressionable, patriotic young men from Anna Faktorovich’s fictitious Sparta, Tennessee joined the fight against Fascism during World War II. They confronted death, cruelty, deprivation and returned home not as heroes but outsiders. Sparta had no use for them—no jobs, no place in society, only bars and the local jail. Finally enough became too much. Outrage triggered rebellion and a new war began. Like the one the returned G.I.s had left in Europe and Asia this one also was for freedom from oppression. “An intriguing and often funny depiction of widespread governmental corruption in a mid-1940s southern city and the political efforts of a band of World War II veterans and their allies to address it.” —Jere Krakoff, retired civil rights attorney with the ACLU National Prison Project in Washington, D.C. The Burden of Persuasion: ($20, 250pp, 6X9″: Softcover ISBN-13: 978-1-68114-323-1; $35: Hardcover ISBN-13: 978-1-68114-324-8; $2.99: EBook ISBN-13: 978-1-68114-325-5; LCCN: 2017937187; Mystery; Release: October 16, 2017; Purchase on Amazon or Barnes & Noble): The trauma of retiring early forces FBI Special Agent B. Clare Ryan to conduct an unsanctioned investigation into one of her first cases for the Bureau back in 1988. After an unfavorable verdict that was the culmination of eight years of litigation over claims of sexual harassment of Ida Callaghan by the management at the Bedford Bank in Manhattan, her father, Bradley, shot the judge over the case, Vincente Brunetti, to death at his suburban residence before committing suicide. The case is outrageous enough on its own, but Ryan is more interested in why her supervisor at the FBI forbade her from investigating it and destroyed the suicide note that Bradley left behind. This clue leads her to a diary that accuses many powerful men in New York of corruption. Now in 2013, the trail might be cold, but Ryan digs up ancient records and does everything possible, including breaking into private vaults and morgues to get to the truth, which turns out to be more explosive than she predicted. Ryan reproduces original diaries, notes, letters, police reports and other documents that finally sufficiently prove the case that both Bradley and his daughter lost. Ryan takes on the burden of persuasion and brings this case to the public at large, hiding under the veil of fiction what she cannot expose in the court of law. What was the connection between this federal Judge and a major bank like Bedford? What drove Bradley to homicide instead of another appeal? 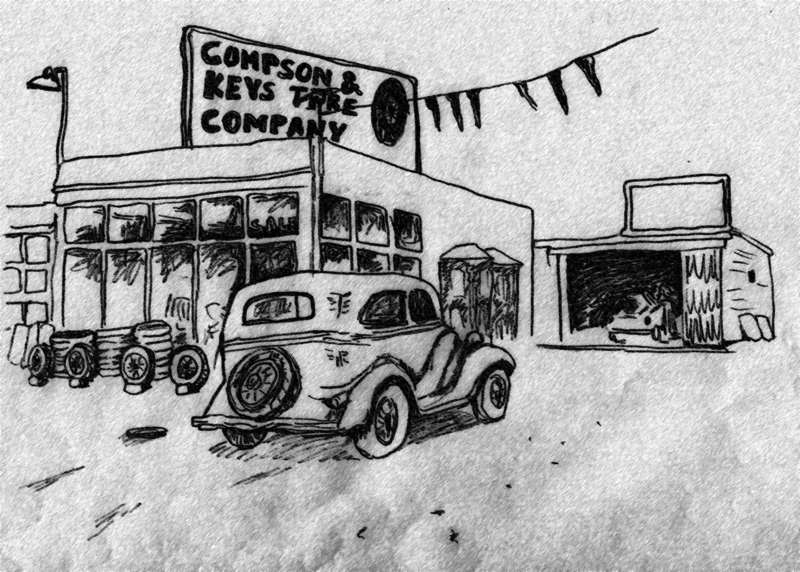 Why were there five hundred sparkling-new, but unused, Bronx-made Vachengrais autos parked outside Bradley’s precinct in 1969? What was Bradley’s boyhood friend, Terry, who later became the Chief of NYPD, doing on a military base in East Germany in 1955 that sent everybody in this story on a violent collision course? This mystery begins after the whodunit is long solved. Only hidden personal confessions can display what corruption has obstructed from the eyes of justice. “This is an extraordinary book – its combination of levels from the publisher indicating that a (perhaps) fictional former FBI agent uncovered diaries of the perpetrator of a crime (killing the judge in his daughter’s harassment trial) and then also finding the daughter Ida’s first-hand account – all interwoven with discussion of harassment and bad treatment (in the FBI too) of women, treated as secondhand citizens – even when we read the judge’s notes to his wife as she worked up his opinion for him – she too sees that the judgement/opinion he has evolved against the victim is flawed – but he is too lazy to alter it, or bring real thought to bear on it – and she caves (she also scrubs the floor, insisting piously that she ought to)… the underlying anger – acted out by an enraged father – bristles throughout the compelling story of her search into the crime that got away from her in the early days of her career – this is a terrific book, and deserves good attention. ****” –Leslie Gardner, co-founded Artellus Ltd. Fatal Design: (Softcover: $15, 344pp, 6X9”: ISBN-13: 978-1-68114-481-8; Hardcover: $30: ISBN-13: 978-1-68114-482-5; EBook: $2.99: ISBN-13: 978-1-68114-483-2; LCCN: 2018910240; Edited by Jodie R. Reed, Kate Mitchell and Nicholas Birns; Fiction—Mystery & Detective—Police Procedural; Release: December 21, 2018): Lucinda Thoso, the new Murder Beat reporter, joins the busy newsroom of Cherub Daily. She is immediately thrust into the heart of Los Angeles’ gangs, vindictive lovers, corrupt bureaucracy, unintended bloodshed, and convoluted conspiracies. The hunt for the truth becomes personal when Lucinda receives a cryptic newspaper-clipping note in her own mailbox at Cherub that warns of an impending murder. When Lucinda arrives, the threat is proven true: the slashed body of a social worker is an unusual victim that shocks the city. Why would a killer leave a note inviting the discovery? Who would want to kill a lonely caseworker in her home, and yet leave her expensive possessions? Just as answers begin emerging, Lucinda and her police contact, Detective Clovis Pesupetep, are faced with a new gruesome murder of an administrative nurse. With her decades of experience with the macabre, Lucinda finds clues where a slew of techs and detectives fail to see them. On top of their oversights, Clovis’ partner, Didier, resists each clue Lucinda uncovers, blocking her progress. Despite great strides, Clovis and Lucinda discover that the realities of crime investigation within the LAPD are such that only subterfuge can lead to the hidden truth. Free Review Copies: Available to reviewers who plan on publishing the review, and to academics considering the book for their class(es). Email a request for a Review Copy to director@anaphoraliterary.com. Anna Faktorovich is the Director and Founder of the Anaphora Literary Press. She taught college English for three years before focusing entirely on publishing. She has a PhD in English Literature. She published two scholarly books: Rebellion as Genre in the Novels of Scott, Dickens and Stevenson (McFarland, 2013) and The Formulas of Popular Fiction: Elements of Fantasy, Science Fiction, Romance, Religious and Mystery Novels (McFarland, 2014). She published two additional scholarly books with Anaphora: Gender Bias in Mystery and Romance Novel Publishing: Mimicking Masculinity and Femininity and Wendell Berry’s New Agrarianism and Beyond. She also published two poetry collections Improvisational Arguments (Fomite Press, 2011) and Battle for Athens (Anaphora, 2012), an illustrated children’s book, The Sloths and I (Anaphora, 2013) and two novellas, The Great Love of Queen Margaret, the Vampire and Campaigns Against the Olden (Grim’s Labyrinth Publishing). She won the MLA Bibliography, Kentucky Historical Society and the Brown University research fellowships.